Manuscripts must be in English and must not exceed eight pages, including figures, tables, and reference. Manuscripts must be typed only on one side with double space on A4 white paper. Original research papers; review articles; case studies; short communications; reports of conferences and meetings: book reviews, forthcoming meetings: Advertisements. Submission of a manuscript implies that the work described has not been published before (except in the form of an abstract or as part of a public lecture, review or thesis); that it is not under consideration for publication elsewhere; that its publication has been approved by all co-authors, if any, as well as by the authorities at the institute where the work has been carried out; that, if and when the manuscript is accepted for publication, the authors agree to automatic transfer of the copyright to the publisher; that the manuscript will not be published elsewhere in any language without the consent of the copyright holders. There are no handling charges. It is preferred to have the manuscript organized under the following headings. Do not submit a manuscript which includes any other section Boldface type is preferred for headings A, B, D, F, G, H and I, italic type is preferred for heading C and H.
D.	Abstract: Should not exceed 250 words capitalizing on ABSTRACT. E.	INTRODUCTION: Do not use a section heading. 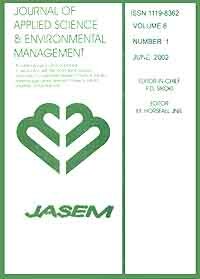 Two or three paragraphs that concentrate on the relevance of the study to applied sciences & environmental management suffice for this section. F.	MATERIALS AND METHODS: Do not use subheadings. Do not underline: use all capitals for the section heading. Use italics for subheadings if they are unavoidable. G.	RESULTS AND DISCUSSION: Do not use subheadings. Do not underline: use all capitals for the section heading. H.	Acknowledgements: This should appear as a separate paragraph two spaces below the last paragraph of the text. Acknowledgements should be limited to six lines. I.	REFERENCES: Use all capital for this section heading. References are single-spaced and appear in alphabetical order. All papers cited in the text should be given in parentheses, e.g., Georges-Ivo, 2005; Horsfall and Spiff, 2005; Klungness et al., 2005) except when the author is mentioned, e.g., ‘‘and the study of Hillman and Tasca (1989)’’. Reference must be limited to one page, very relevant and up to date. Georges-Ivo, EE (2005). Fourier transform infrared spectrophotometry and X-ray powder diffraction as complimentary techniques in characterizing clay size fraction of kaolin. J Appl Sci Environ Manage 9 (2): 43 - 48. Meltzer, Y L (1971). Hormonal and Attractant Pesticide Technology. Noyes Data, Park Ridge, N.J.
Latey, J (1985). Relationship between soil physical properties and crop production. In: Stewart BA (ed) Advances in Soil Science Vol. 1 Springer-Verlag, New York, p277. References by the same author(s) are arranged chronologically. If more than one reference by the same author(s) published in the same year are cited, use a, b, etc after the year of publication in both text and list. The submission has not been previously published nor is it before another journal for consideration; or an explanation has been provided in Comments to the Executive Editor. Please refer to the author guidelines - check the "About" and "Submissions" for most up-to-date information for authors. Electronic manuscripts should be prepared in the appropriate format, according to the instructions given under the “Instructions to Authors” section. Contributors can assess the Instructions to Authors. In addition, authors should ensure that the scientific and style instruction of electronic manuscript be strictly followed. 1. Follow the instructions in the Instructions to Authors when preparing the manuscript. 2. Tables with suitable captions at the top should be kept to a minimum. Each table should be on a separate page numbered consecutively in Arabic numerical with a heading and footnotes. Tables should be prepared in Microsoft word and place at the end of the text on separate sheets (one table per page). 3. Do not use space bar to make indents; where these are required (e.g. tables) use the TAB key. 4. Figures should be prepared using applications capable of generating high resolution such as Picture (Enhanced Metafile), etc, format before pasting in the Microsoft word manuscript file and place at the end of the text on separate sheets (one table per page) and numbered consecutively in Arabic numerical. 5. Please ensure that after conversion, figures and its legends, captions and numbers and symbols inscribed must be large enough to be legible after reduction in size. 6. The same data should not be presented in both table and graph form or repeated in the text. Disclaimer: No responsibility is assumed by the Publisher for any injury and/or damage to persons or property as a matter of products liability, negligence or otherwise, or from any use or operation of any methods, products, instructions or ideas contained in the material herein.